Your staff can instantly notify you with text on our alpha-numeric pager. Easily stay updated with critical information whether you work in hospitality, healthcare or a church nursery. The alpha-numeric pager is a durable and reliable pager that uses AAA batteries that you can replace yourself. Save and scroll messages as needed on an easy-to-read LED screen. 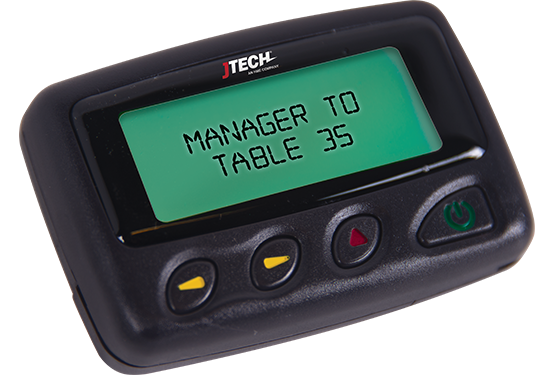 The Alpha-Numeric Pager is a popular choice for staff and management on the go. Out-of-Range and Search ensures contact. Choose silent, vibe or beep to recieve notifications. Choose between alpha text, numeric or rugged rechargeable pagers.